Who hasn’t heard about Design Thinking? And is that in recent years it has taken popularity and great importance in IT companies. There is no innovation event or meeting in which this term isn’t used. But what is it about and what is its real usefulness? Several specialists have talked about of the projections of this methodology, which is increasingly used by companies related to the development of new products and services. Design Thinking is considered such an important tool, that the world’s biggest companies like Apple, Google, and more, consider it within internal processes. This methodology is gaining ground and has positioned as an indispensable strategy to accelerate innovation. It’s presented as a methodology that generates innovative ideas that focus its effectiveness in trying to understand and solve the real needs of users in other words, it’s an approach that emerges from the sensibility of the designer and his problem-solving method, in order to satisfy the needs of the people in a technologically feasible and commercially viable way. What do I need to apply it? The work should be carried out by a multidisciplinary team to generate different points of view, knowledge, experience and opportunities for innovation; the more multidisciplinary is your team, the more valuable information is brought together. Also, motivation and a great attitude are essential to fulfilling the purpose. I recommend having a suitable place or area to develop your teamwork. It should be a spacious room with a table where you can all gather to brainstorm and discuss. In case you need to connect with remote colleagues or participants, be sure you have good internet connectivity. Collect the necessary material such as colored paper sheets, sticky notes pads, pens, markers, and boards or walls where you can stick-on your ideas. Avoid as much as possible all the distractors that impede the workflow of the team, remember that you need to be focused and inspired to lead creative ideas. 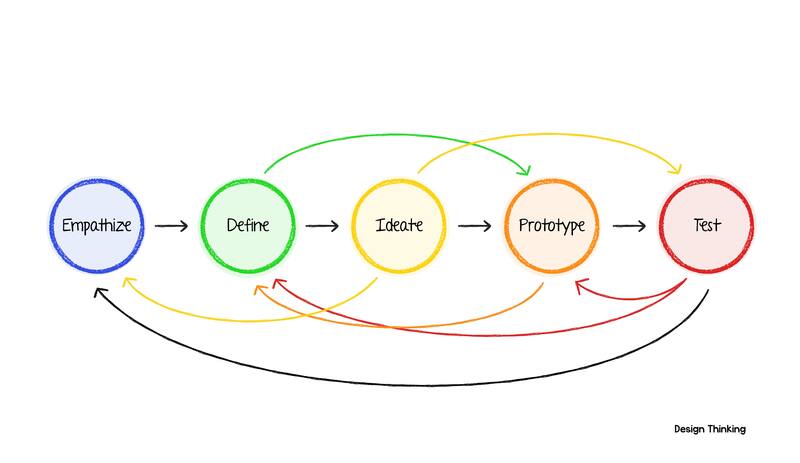 How to apply Design Thinking in product development? Product development can be easier and more effective when applying this methodology. Just be sure to follow the next steps and you’ll be ready to success your next IT project. -Empathize: You must first think about the problem to solve. To obtain enough and reliable information, empathy is a good ally so don’t take any assumptions. Observe and analyze the possible target user by having a small interview or a preview mini test and see how they react and thrive. Try to respond these questions to develop empathy with your users: what do they do with your product? how would they use it? what do they think? and, how do they feel about the brand or product? -Define: All the data collected on the empathy phase is very important, you must have a record of any experience you got to define the problem. Design Thinking uses similar methods to focus groups and interviews in order to get reliable data and find insights easier. -Ideate: Generate as many ideas as possible. In this phase it’s absolutely necessary to avoid being prejudiced, no matter how absurd ideas may seem, each one of them apport positively to the team. The intention is to encourage participants to think “outside the box”. And remember that you are focusing on quantity not the quality of your ideas. -Prototype: Build prototypes of the most promising ideas. This will help you to visualize the possible solutions, and let’s face it, this step is one of the most fun and rewarding because developing a prototype gives you the opportunity to really tap into your creativity using those skills that inspired your ideas. -Test: At this point, your work will be to test your prototype in the real life, with real people so you can learn as much as you can from their reactions while interacting with your product. This will help your team identify what didn’t work, what went well and what you can improve. So you can later direct the product on the idea that you were looking for. In MagmaLabs we believe that Design Thinking is a must-have in all the projects that we work. We always consider it when building product design sprints and ecommerce sites or mobile apps to ensure consumer satisfaction.